We here at Magnificent Moments Weddings get to work with some pretty amazing couples and we love nothing more than helping them make their wedding dreams come true. So it is time again to shine our client spotlight another amazing bride! We want to share how awesome they are with you and give them the opportunity to relive their special day! So this month we reached out to Kelly Johnston and asked her to share her greatest memories and any tips she may have for soon to be brides! 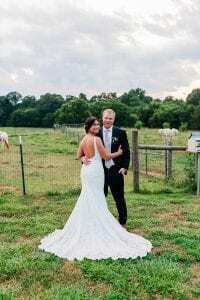 Kelly and Kevin were married at The Dairy Barn in Fort Mill, South Carolina on June 16th, 2018. 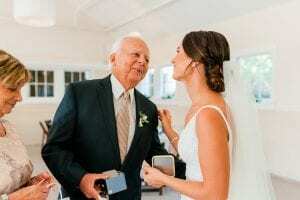 Their neutral tones wedding was simple yet elegant and a great reflection of their couple style (Want to know all the details about Kelly’s big day? Check out her real wedding feature on the blog here!). Since Kelly was such a great bride to work with, we wanted to sit down and ask her all about her experience, from the high to the lows, and here’s what she shared. The greatest moment was waking down the aisle. I absolutely loved seeing my friends and family when I first came out and then seeing Kevin at the end was the best feeling. My advice for brides would be to stay on top of all the deadlines and make sure to keep yourself as organized as possible. Keeping yourself organized will save you from stressing on the actual day! If I could change one thing I would have been more on top of the music at the reception. I wasn’t in love with his choices. I chose MMW because Amanda seemed very on top of things and I could tell she would get the job done really well. Kevin even said after that Amanda really surprised him because based on her emails she’s so nice but on the actual day she was firm when needed (with all his crazy friends). Another thing that made me like Amanda is she paid for my drink when we first met and I thought that was very professional because other coordinators I met with did not do this. I would 100% recommend a coordinator. I would NOT have been able to have a perfect wedding if MMW was not there. Thank you, Kelly, for all your kind words! You and Kevin were truly an inspiring couple and just a dream to work with! Your wedding was truly one to remember!